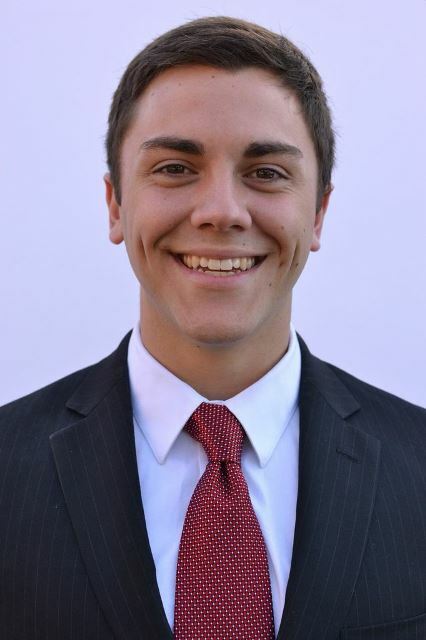 WACO, Texas (July 28, 2015) – Baylor University alumnus Jake Surges is one of four Baylor students and recent graduates who have been selected to receive the prestigious Fulbright Scholarship. Surges is a University Scholar and a Crane Scholar, an arm of the Institute for Faith and Learning. He received the Fulbright English Teaching Assistantship (ETA) and will spend the 2015-2016 academic year teaching English in Taiwan. Jake Surges: I had been waiting to hear back from Fulbright for a couple of months because I knew of a lot of students who had already heard back from Fulbright. I found out on a Friday at about 11 a.m. I received an email and five minutes later, Elizabeth Vardaman, associate dean for special programs at Baylor, called to congratulate me. I was elated. One moment I was sitting around having a slow Friday morning, the next moment I was staring at my roommate in shock. I couldn't believe that I had won an ETA award. Why did you decide to apply for the Fulbright and why did you choose Taiwan? Jake Surges: I decided to apply for the Fulbright after many conversations with Dean Vardaman, who is one of the most delightful people to speak with at Baylor. She made very clear suggestions and encouraged me to decide how to proceed based on what program and country I thought would be the best match. I've been interested in Asia for a number of years now, China in particular. The funny thing is that I cannot explain my interest. I simply find East Asian culture intriguing. During my time as a community leader in Martin Hall, I lived with various exchange students from China, Korea and Indonesia. Living with those guys only fueled my interests. The summer before my senior year at Baylor, I went to the Salvation Army store in Waco to look for some furniture for my new apartment. In the store I found a Chinese painting titled, "Fisherman in Reclusion on an Autumn River." I loved it. I bought the scroll and looked it up when I got home; the original hangs in the National Palace Museum in Taipei. My interest in Taiwan grew from there. My longstanding interest in Asia, conversations with Dean Vardaman, a new Chinese painting and Mandarin Chinese classes that I planned to take my senior year all contributed to my decision to apply for a Fulbright ETA Award in Taiwan. What will you do in Taiwan? Jake Surges: I will help teach English in an elementary or middle school in Kaohsiung, a city in southern Taiwan. I'll most likely be in a classroom with a Taiwanese teacher, and I'll bring American culture and more fluid English speaking into the classroom. I'll also help form an after-school program that will be fun for the kids and further assist language learning. Other than these responsibilities, I plan to spend as much time with Taiwanese people as possible. I'm eager to learn their culture and language. Why did you decide to come to Baylor for your undergraduate? Jake Surges: I applied to many large research institutions to study science. In a moment of honesty, I acknowledged to myself that I wanted to study Christian theology, and so I began looking at Christian institutions. A friend of mine had cousins who attended TCU, and they told me that they knew a guy from Baylor. I followed up and after learning about the University Scholars Program, I was basically sold. I was pre-med but wanted to study theology. The University Scholar Program offered a unique opportunity to study both. Jake Surges: I am currently considering two paths to pursue after my year in Taiwan. Due to my interest in Chinese culture and Mandarin Chinese, I am very interested in staying in Taiwan or living in China in order to continue immersion in Mandarin and Chinese culture. I'm also heavily considering law school, but I know that I may not have the same opportunities to immerse myself in a different culture after graduating from law school, which adds to my want to stay in Taiwan or China for another year or two. Jake Surges: I enrolled in courses taught by Dr. David Jeffrey during my first and last semesters at Baylor. Each class left deep impressions and helped shape my idea of Christian education. During my junior year, my foundations were shaken and a lot of questions arose. Dr. Jeffrey was always gracious to accept me into his office and to answer my questions. Dr. Jonathan Tran advised me for many semesters at Baylor. I don't think that I've ever met anyone who is more attentively present with pupils than Dr. Tran. I always left his office well advised, satisfied and grateful. Dr. Tran also advised my hectic senior thesis and helped me through the intense period of time surrounding that project. I warmly think of Dr. Darin Davis, Dr. Jason Whitt and all other professors who share leadership over the Crane Scholars Program, a program that bound me to good friends and set forth a good example of how to pursue knowledge within community. My senior year, I took two courses by Dr. Alan Jacobs. He reintroduced me to poetry, for which I am exceedingly thankful. He also expanded my intellectual horizons and challenged my thought and articulation. David Jeffrey, Ph.D., Distinguished Professor of Literature and Humanities; senior fellow at the Institute for Studies of Religion: Jake Surges is possessed of an alert, enquiring intelligence and a desire to learn from a wide range of sources and individuals. His interest over several years in Asian culture is consistent with this, and his amiable and generous spirit should make him an ideal Fulbright representative in Taiwan. Jonathan Tran, Ph.D., associate professor of theology: Those of us who have had the privilege of working with Jake Surges celebrate with him and his family the great achievement of his Fulbright Scholarship. Along with completing Baylor’s prestigious and highly rigorous University Scholars undergraduate degree program, Jake was a Crane Scholar, served as a Community Leader for Martin Hall, worked as a counselor for the Honors College summer program Renaissance Scholars and will graduate with Phi Beta Kappa honors. He completed a demanding and important Honors thesis on the moral philosophy of ordinary language theorist Cora Diamond. Beyond the academic work, I’ve gotten to know Jake quite well and am most impressed by his character and the quality of the relationships he has with his family and friends. He applies his very astute mind to matters of import and has consistently pursued a life possessed of a vocational calling that has less to do with what he is able to do, which includes a good many things, than what he should and loves to do, a calling genuinely possessed of God. We at Baylor adore these things about Jake and take great pride in calling him one of our own. Darin Davis, Ph.D., assistant professor of Christian philosophy and ethics; director of the Institute for Faith and Learning: Jake Surges is a remarkably bright and accomplished young man, who will use his gifts of heart and mind to teach others through the Fulbright Scholarship. Those of us who have known Jake through his participation in the Crane Scholars Program could not be more pleased for him as he assumes the challenge and opportunity ahead. Jason Witt, Ph.D., associate director of the Institute for Faith and Learning: Jake Surges is an intelligent and articulate young man whose deep commitment to his faith is evident throughout his life. Throughout his time at Baylor, he has been diligent in seeking to discover how faithfulness to Christ might be expressed through his academic study and future calling. The Fulbright Scholarship affords him the opportunity to continue his growth as he both teaches and learns from those whom he will serve. Alan Jacobs, Ph.D., Distinguished Professor of Humanities in the Honors Program: Jake is by every measure an outstanding student, but what the standard criteria of academic excellence can't capture is Jake's generous curiosity. His interests are very wide, and he is always seeking new knowledge and new perspectives on that knowledge. He asks, listens, evaluates and asks again. He has the perfect temperament to benefit from the experience of the Fulbright, and I know he will make Baylor proud, and will also be a great ambassador for Baylor. Baylor University is a private Christian University and a nationally ranked research institution, characterized as having “high research activity” by the Carnegie Foundation for the Advancement of Teaching. The University provides a vibrant campus community for approximately 16,000 students by blending interdisciplinary research with an international reputation for educational excellence and a faculty commitment to teaching and scholarship. Chartered in 1845 by the Republic of Texas through the efforts of Baptist pioneers, Baylor is the oldest continually operating University in Texas. Located in Waco, Baylor welcomes students from all 50 states and more than 80 countries to study a broad range of degrees among its 12 nationally recognized academic divisions.